As a Chinese, I’ve never had to think hard when it comes to buying noodles at the market. Noodles are a staple in Chinese cuisine; the varieties of noodles available are just like pastas to the Italians–they come in different sizes, shapes, colors, texture, and forms. There are rice vermicelli, yellow noodles, green (spinach) noodles, egg noodles, steamed chow mein, pan-fried chow mein, lo mein, crispy noodles, Shanghai noodles, fresh noodles, glass noodles, udon-like “laifen,” flat rice noodles, Taiwanese noodles, etc. And then, there are dried packaged noodles from all over Asia and the lists and brands go forever on. Despite the many offerings in the marketplace, picking out the right noodles for that perfect fried noodles dish is our natural ability. However, the experience could be overwhelming for others, a fact that I have just come to realize. For many non-Chinese/Asians and Asian food beginners, buying noodles is a somewhat daunting–not to mention confusing and frustrating–task. There are just too many different noodles to choose from–especially if you shop in Asian supermarkets. For example: how do you tell the difference between “steamed chow mein” and “pan-fried chow mein?” They look almost identical; the only difference is the texture of the noodles. Rice sticks are also called rice vermicelli or rice noodles in the United States. In Chinese, we call them 米粉 or mifen as they are plain noodles made from rice flour and water. In Malaysia and Singapore, they are simply known as beehoon or meehoon. The Vietnamese call them bun. They are very common across all Asian cuisines, be it Chinese, Malaysian/Singaporean, Indonesian, Filipino (called pancit or bihon), Thai, or Cantonese. Rice vermicelli is always a safe bet if you are just starting to learn about Chinese noodles. For this fried rice sticks with chicken recipe, I used the simplest of ingredients–chicken, rice sticks, and bean sprouts (which lend a “crunchy” texture and a refreshing taste to this dish). Despite the uninteresting and very humble look, fried rice sticks always rank high in the taste department. 炒米粉 or fried rice sticks do make a good and satisfying meal. 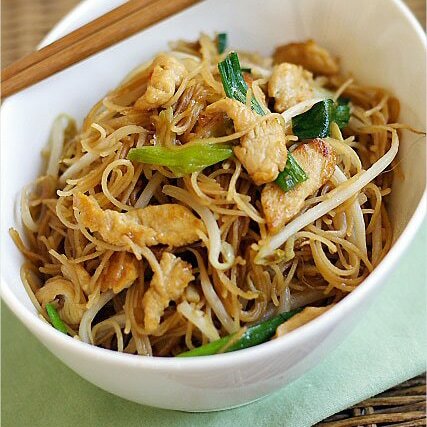 Fried Rice Vermicelli/Rice Sticks/Rice Noodles Recipe - For this fried rice sticks with chicken recipe, I used the simplest of ingredients–chicken, rice sticks, and bean sprouts. Soak the rice sticks in warm water for 30 minutes or until they turn soft. Set aside in a colander to drain the excess water. Rinse the bean sprouts with water and set aside to drain excess water. Lightly coat the chicken meat with the corn starch (to tenderize the chicken). Mix all the seasonings and water together and set aside. Heat up a wok and add in the cooking oil. Add in the chopped garlic and stir-fry until aromatic or turn light brown. Add in the chicken meat and stir fry until the chicken is half done. Add in the rice sticks and then follow by the seasonings. Stir the rice sticks continuously to blend well with the seasonings. Continue to stir fry for 2-3 minutes or until noodles turn soft or no longer wet, then add in the bean sprouts and chopped scallions. Stir-fry for another minute or until the bean sprouts are cooked. All photos and recipes on Rasa Malaysia are copyright protected. Please do not use the photos and recipes without prior written permission. If you wish to republish this recipe, please rewrite the recipe in your own words instead of copy and paste and link back to http://rasamalaysia.com/recipe-fried-rice-vermicellirice/. Thank you very much! That looks so goooooooood! I just got back from a hike and am starving and what should come up on my google reader feed but this gorgeous dish!?! Are you doing this on purpose? ;) Thanks for the recipe, Bee. I’ll have to try it for sure! I sometimes try to look through the many different kinds of Asian noodles after reading about them here, and other blogs. But I have such a difficult time with some packages, because the English translation isn’t very understandable. Since you’re at least bilingual, does this happen with food products made from English speaking countries too? Since your current post concerns noodles and my comment concerns all things Malaysian…may I put in a request for a ‘Wan Tan Meen’ recipe? I think I haven’t yet encountered noodle frustration because I have yet to venture into the world of fresh/refrigerated noodles :) I love your recipe here, although it’s not very easy to find sweet soy sauce… I think I need to write down its chinese name! This is the kind of noodle recipe that I could eat every day. The ABC would make it a bit sweet — lovely. I wasn’t born Chinese, but I love noodles so much that sometimes I wonder if I were Chinese in a former lifetime! Ooh, lovely, lovely bowl of noodles! One question: do you have a problem with the noodles breaking when cooking? Sometimes, our rice noodles end up being little rice sticks at the end. Sidenote: ‘pancit’ is a generic term, like ‘noodles.’ The term, in my experience, is used to describe dishes with different types of noodles. We’ve always just called rice noodles ‘bihon’ as well. Hi Bee. Looks absolutely delicious. Thanks for the noodle summary. It can often be a daunting thing when I’m staring a a sea of different noodle brands in my local Chinese grocer. That looks so good; as always, your photographs are very well done and get the hunger pangs going strong. Small world because just today I was in two (the only two) Chinese grocery stores in this Southwest USA border town looking for fresh noodles. I was specifically looking for noodles for Japanese-style ramen, called Chukamen (yellow noodles). Bought two packs called Nouilles jaunes (Yellow Noodle) imported from Taiwan, but they are only about 8″ long and verrrry thin. Also bought a refrigerated pack from Japan called Myojo, but its ingredient list reads like something from a pharmacy, what with all the preservatives. And because it’s so hot here, I got buckwheat soba (dried), to eat for lunch. There are no fresh noodles to be found here outside of making them oneself, but the variety was good, including the rice sticks you mentioned, plus varieties of rice noodles from China and Thailand. I guess the next step to a perfect miso ramen here is to make the noodles myself! I love char beehoon, my breakfast every morning, the economy one. All – thanks for your sweet comments. Keep them coming. Rachel – good suggestion about wonton mee, I will try to make it soon and share recipe. If you are looking for Vermicelli/rice noodles that won’t break-try the Buddha Brand-from Tai Wan. It is the best for making your recipe. Also a comfort dish for me. Those sold outside usually too greasy. Yours look tasty and non-greasy. There is something about vermicelli noodles that I find irresistible! I can eat bowlful after bowlful. There is something about them being so thin that I love. Anything with rice noodles is a must. Love this type of dish! Yum! This is my all time favourite. So as stir-fry egg noodles.. simple but delicious. I do like to eat with cut chili..simply delicious. Your food always excites me! I will have to give this try in the near future! You take really great photos! As usual, I could never get enough of your photo shoots. Having said that .. you cook well, write well … well, what can I say. An ideal foodie. Guess we have lot’s to learn to carry that title. Impressive… when are we having a party? :P I’m also a lover of noodles of all types and I usually cook a big wok for my family of 6 adults and 2 kids. I have tried many dried noodles from bee hoon (rice vermicelli) , green peas noodles, soy bean noodles, spinach noodles etc and found the Emperor’s Noodles (Wong Tai Min/Ong Tay Mee) the easiest and most delicious noodles to be used either fried, semi-wet or with soup. All I need to do is to set the water boiling and throw in one or two of the noodles. Stir for one minute and drain. You will just need some garlic with oil, soy sauce, sesame oil and pepper. Your article is really informative as I don’t really know the in depth of noodles, its just that I love the texture of my noodles to be QQ and not having too much of the ‘flour’ smell. Thanks for sharing the receipe too. I’m originally from Singapore and now live in Portland Oregon. We have a variety of bee hoon noodles here that are available at the asian grocery stores, but I can’t seem to find one that would work well for Fried Bee Hoon, and one for Mee Siam. They always seem to either be too fine or too coarse. Do you have any favorite brands you can share for particular dishes you make? Fay – I don’t have a particular brand that I like, but I usually like those made in China, and that the ingredients show rice flour and water only. Some rice vermicelli for example the Buddha brand from Taiwan adds tapioca flour to it which makes them slightly starchy and not to my liking. One brand that is good is “Kong Moon” Brand Made in China. Hope this helps. Looks delicious. I’m definitely making this dish soon. I love bee hoon, can eat many helpings on it! If you’re like me and you have run into frustration finding a quality brand of sweet soy sauce, there is a very simple solution. I’m very particular to the flavor of my sauces, and I find it very frustrating switching brands – I can tell the difference and I usually don’t like it. Most asian recipes call for sweetened soy sauce, but I like the flavor of Kikkoman which is definitely not sweetened. Solving this problem is simple. Just make yourself some plain syrup – heat a cup of water and stir in sugar until it has a very sweet flavor. Store this, and any time a recipe calls for a tablespoon of sweet soy sauce, add a half tablespoon of the syrup with it. I prefer fried rice vermicelli to other noodles. I will make some using your fried rice vermicelli recipe. When cooking the rice vermicelli one of the big problems i have is it sticking together. It was recommended i use salt but my doctor says no salt. What other options are there? Even after that, they will stick when you start to fry them, though. Really what’s going on is there isn’t enough liquid. As you fry the noodles continue adding some sort of liquid while turning the noodles vigorously. They will eventually begin to separate; at this point you can just add a small bit more liquid to soften them as desired. You can’t just keep adding sauce, so when the dish is seasoned to your taste start using water. Give it a try; you might get better results. hey this is a really good recipe just wondering how many this recipe serves? As i was making for 1 and the amount of seasoning i added im guessing was too much for how many noodles,and it kinda made it alot too liquidy and mushy. I hope next time by not adding so much seasoning it will come out better. Jord – I used half a pack of the vermicelli or 4 oz. It serves 2 people. If they are mushy, it might be that your vermicelli is not of good quality. Some rice vermicelli tend to be soggy after cooking. You just have to try different brands to find a good ones. I just made this with the substitution of veggie mix instead of bean sprouts. DELICIOUS! What do you call those green noodles often eaten with oyster sauce?! I often see them in Korean movies. I have been trying to cook noodles like this for years and have always ended up with a noodle “deathstar”. bits all sticking to a ball of noodles. I used your no pre cooking of the noodle method and the results were immaculate, first time!! Thank you so much for a great recipe. Love your recipes. Do they generally make 4 servings? Would be great if that could be included at the end of each recipe (along with cooking tips and/or suggestions). I made this twice. The first time it was perfect. I was so excited that I could successfully make an Asian noodle stir fry! The second time the noodles were under cooked and crunchy. Both times I followed the directions. What do you suggest I do? I am pretty sure I used the same brand of noodles made with just rice and water. Cooking with rice noodles is tricky business. I tried a different rice noodle recipe and had the same problem with under cooked noodles. Soak the noodles so they are soft before cooking. If under-cooked, that means they are not properly soaked before cooking. Okay, made this again tonight. I soaked the noodles ten minutes longer (40 minutes total). When I was done with the stir fry I was left with clumps of sticky noodles:( Should I be using cold, warm or hot water? How do you know the noodles are done soaking, and soft? Are they completely limp? I can’t figure out why the first time was perfect and the last two were fails. I am a perfectionist and I will keep trying until I master how to cook these noodles! You just have to keep trying because I don’t know the brand you use. You soak with warm water. I saw some fresh rice vermicelli at an Asian market. Would they be okay to stir fry? Yeah you can but sweet soy sauce is not spicy. You can just use dark soy sauce and add a little sugar. Thank You, I’m going to make it today. I just made them today. I used Dong Guan rice noodles from china, always soak in COLD water for 1/2 hour till limp and drain out the water, this way when u fry it wont break. I recommend frying the chicken and any vegetables separately first and put aside. Then you fry the noodles by itself with seasoning and when almost done, stir in bean sprouts, dont over cook beansprouts but if you cant control, fry it separately, then mix them up in a container before serving. Best eaten with sweet chili sauce. Also if u keep the beansprouts separate u can keep leftovers longer in fridge, cos if not, the noodles turn bad quickly if mixed with bean sprouts when leftover. I haven’t try out this dish with sugar added! Interesting… thanks for sharing, let me try it out! I need some help finding the noodles I am in a little state SC in USA and I don’t know where to start to get these noodles…can anyone help? A particular website, anything? Thank you in advance! You can get it from AsianSupermarket365.com. How many servings will this recipe come up to? Tricia, I made this and it was enough for five people (and a little extra for each). Outstanding recipe though! I used soy glaze in place of the sweet soy sauce, everyone loved it! I fried the rice sticks noodles after soaking them in water but it became a big lump when I put them in the oil to fry. what did I di wrong? Marco Polo was give a recipe book when he left the service of Kublai Khan’s court that included many pasta dishes eg spaghetti is our mee, vermicelli is our mifun, fettuccine is our Horfun, ravioli is our wanton. Peporoni is our lup cheong. The Italians added tomatoes, not native of China. And then, cheese. This was great. I’ve been looking for a good base recipe for these kind of dishes and this was the winner. I only added a small shallot and some mushrooms. Just outstanding. Super tender chicken – what a great new thing to learn with the corn starch! Thanks Bee for this recipe. I am pregnant at the moment and so far my cravings been fried bee hoon and also anything related to pork. I am so glad to try this recipe and it tastes exactly to those I had when I was growing up when granny would buy from the pasar, economy fried bee hook with some chili sauce. As for the type of vermicelli I used, the brand is Wai Wai and it has never failed me. Once again many thanks. I’m a newbie at cooking, but when I do cook, I always use your recipes and your recipes never fail me! I love your clear detailed, step by step guide and although it may not look like your pictures but I can rest assured that they do taste great! Thank you for sharing and being so supportive to newbies like myself!!! Thanks Mel for being a fan. I must say that this is comfort food especially to those who have been away from home. Bee Hoon can never go wrong and no matter how simple this dish is, it is always very popular and welcome by the guests. At first I thought it would be too simple for my non Asian other half. But i was just too tired to do anything fancy & decided to take a shot at this. Incredible! He loved it. Thanks for trying the recipe Fiona.